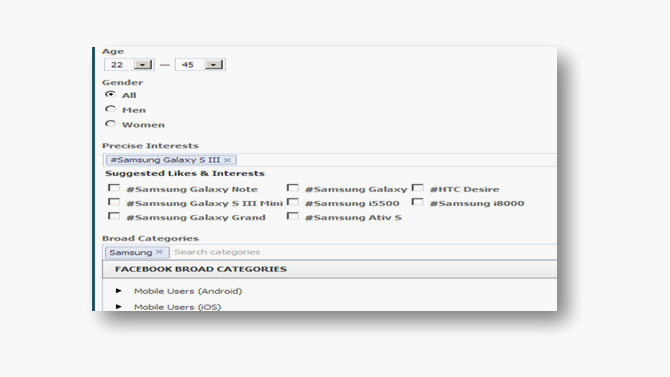 Traditional Ads Manager lets you choose whether to advertise in the Right Column or the Newsfeed. But, Facebook power editor lets you target mobile devices or desktop Newsfeeds. By using this powerful tool, you can save your lots of time as well as money. Further, mobile ads may produce a much greater return, so there is no need to waste money on desktop. With the help of Facebook editor, you can target according to the interest of users. This tool provides you options that help you to target the audience with the content in context of the advertisement. Following example shows the targeted users who have liked Samsung Smartphones and might be interested in other products of Samsung too. You can see how multiple other options pop up while you put anything under ‘Precise Interests’, which Facebook thinks is relevant to your targeting based on your selection. Facebook is trying to merge both of these options under Power Editor for the simplicity of ad creation. If you want to target previously used audiences, other than lookalike or custom audiences, you must manually recreate them in the Ads Manager which is a painful and time-consuming task. But, this problem is resolved in Power Editor, as you can easily save an audience to easily reuse it down the line. By using Power Editor you can filter and organize your various advertising campaigns by tag. If you want to tag a number of campaigns related to a specific product or promotion, you can tag the campaigns and filter by the tag later to promptly find all the related campaigns. As you add campaigns, it becomes more valuable to tag these and organize these into groups. Creating one or more new tags for a given campaign or adding existing tags that you have already established is quite easy in power editor. Another feature that Ads Manager doesn’t offer is the creation of “Dark Posts”. 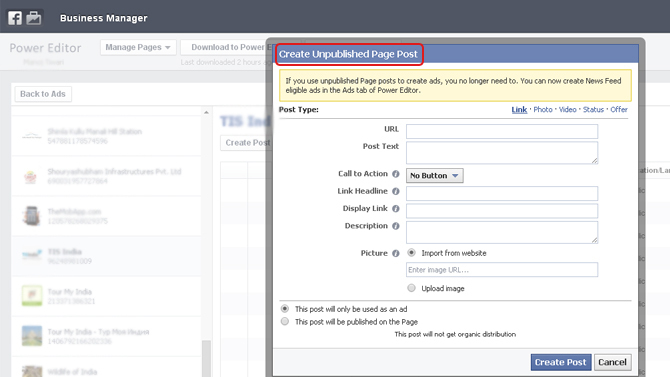 With the help of Facebook power editor, you can easily create “dark posts”, which are unpublished posts that you can use specifically to create ads. It is extremely valuable for split testing ads to the various audiences. The limit in Ads Manager is 25 characters for the headline and 90 characters for the body text to ensure the text is not truncated wherever it is rendered. In Power Editor, you may design ads that have more characters: up to 500 characters for the desktop News Feed and up to 110 characters for the mobile News Feed. It is important when you need just a few extra characters and you are not as worried about the truncated messages. When you have a wide array of ad sets or ads, and you want to modify them, it can take your lots of time. With the help of bulk editing, you can easily check the ads that you want to update, and the changes will be applied to all of them– at once. In the same way, you can also enjoy the feature of bulk import which gives you the ability to set all your ad settings systematically in the Excel sheet, and then import it. It is quite important to measure the investment on social marketing and there are various tips available to increase return of investment. 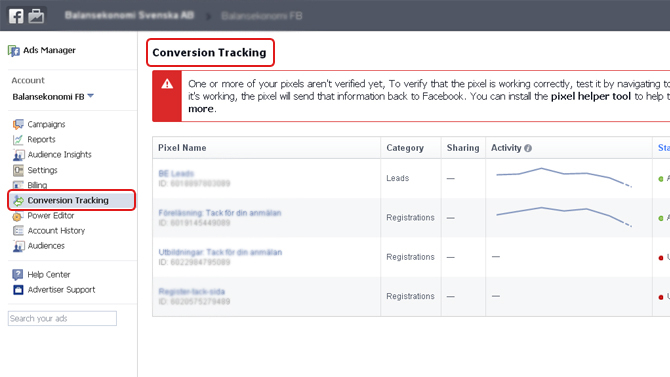 However, Facebook also offers conversion tracking pixels which allow you to see the business objectives that your Facebook ads are meeting (or not meeting), but they are different on Power Editor. The regular Ads Manager only permits you to track a single objective, such as white paper downloads. On the other hand, Power Editor lets you follow your progress on multiple ones. This feature of Power Editor is important when you have several calls to action. 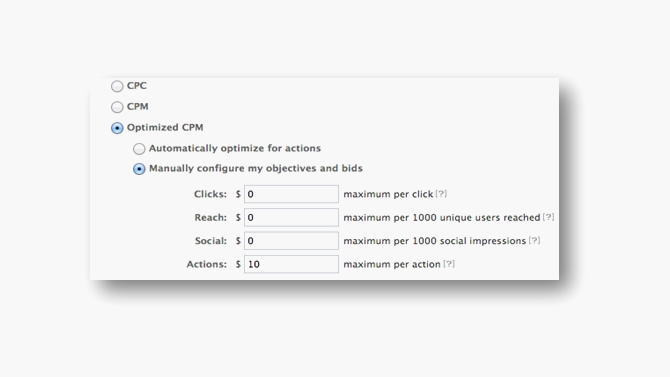 Ads manager tool offers CPM, CPC, and Optimized CPM bidding options, but power editor is different. With the Power Editor, you can actually optimize your bid more -by manually setting clicks, social reach (the number of times your ad shows to the friends of your audience) or actions (comments, likes, shares, installs etc). It will allow you to see more clearly what you actually pay for and a great advantage over the Ads manager. You control your ad spending and return on investment as long as you know how to customize your bid effectively. Power Editor is designed for heavy usage of ads and to scale your ad campaign means that you should manage and create your ads in a very clear and systematic manner. It is a versatile tool for managing and optimizing your Facebook marketing and is definitely better than regular Ads Manager. 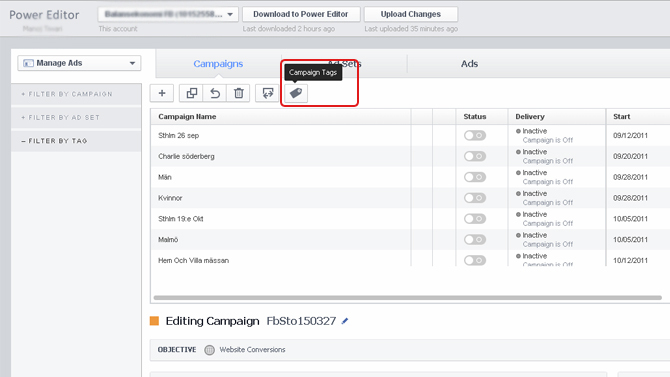 The traditional Facebook Ads Manager is also undergoing updates similar to Power Editor, but Power Editor still remains the best choice for many for advanced targeting of audience. 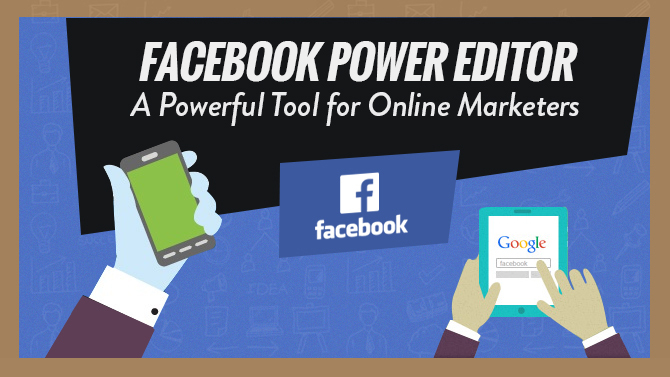 Which feature you love about Facebook Power Editor? You can share with us in the comment box. FIFA 2014: Is Facebook World’s Biggest Stadium ? Facebook Bans “Like Gating” – How to Reset Your Organic Like Strategy?